Jennifer in her Clydesider uniform. 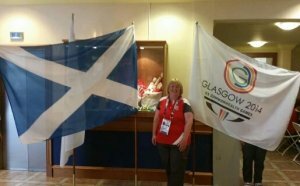 Jennifer McDonald, a mum of 3, has always loved sport and jumped at the change of becoming a Clydesider at the Glasgow Commonwealth Games in the summer of 2014. When August came she moved up to her temporary home in Carnoustie, a couple of hours north east of Glasgow to embark on an experience of a lifetime. 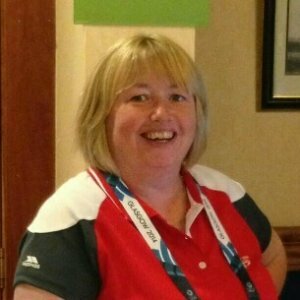 Her role at the Games found her at the information desk at the shooting competition where she was responsible for giving athletes all the information they needed about competing. When talking about her two weeks as a Clydesider, Jennifer explained how it changed her life. "I have always loved sport, so having the opportunity to be part of the Games in Glasgow was amazing and something that I take huge pride in when I look back at it," she said. "Before the Commonwealths, I had been a mum for 20-odd years and felt that I needed a new challenge in my life. The experience gave me a huge confidence in myself that I could go on my own to achieve something and I now have friends all over the country." Throughout her time in Glasgow, Jennifer found inspiration in another volunteer who she got to know well. A young deaf lady was part of her team of volunteers and was just one example of someone who didn't let any barrier get in their way to volunteering in sport. She said: "I believe that volunteering in sport is something that anyone can do and that by helping someone else you gain new skills and friendships yourself." Jennifer didn't want to let her experience become a one-off, so when she came across Join In - a national volunteering campaign and website - she jumped at the chance to get involved. She registered to become a Join In Leader and is now looking to build a local network and find others who want to get into volunteering themselves. The public and friendly face of Join In in your local community – a direct link between Join In HQ and the local sports clubs across the UK which need our help. Someone who is able and willing to build and develop a local network, linking Join In to local communities and volunteers in their area to the clubs who need them. Someone who acts as a spokesperson and pulls together activities during Join In's campaigns to shine a light on the great work done by volunteers in their community. Eddie Izzard, patron of Join In, explains why Join In Leaders are so important. Search Join In to find all sorts of volunteering opportunities in different sports. If you would like to follow in Jennifer's footsteps, then visit the Join In website and find out for yourself what sports clubs and groups need your support. 7 out of 10 sports clubs need more volunteers to help them run their club and develop. There is a volunteering role out there for everyone, depending on the amount of time you can give and what you would like to get involved in.